aside in large mixing bowl. feed tube and process until well blended. seeds and toss to coat. 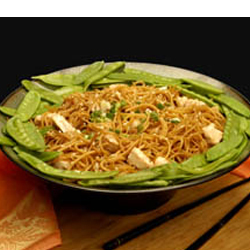 Place linguine-chicken mixture in large flat serving bowl and arrange pea pods on top. Sprinkle with scallions and remaining sesame seeds. Serve at room temperature.